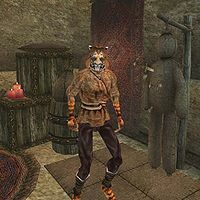 Dro'Sakhar is a Khajiit thief who can be found in Canal South-Two in the Vivec St. Olms Canton. Lorbumol gro-Aglakh, of the Fighters Guild will send you to collect the bounty on Dro'Sakhar's head. Percius Mercius will confirm that Dro'Sakhar is an outlaw. Dro'Sakhar wears a common shirt along with a matching belt and pants. In combat, he relies on an iron dagger. Like all Khajiit, he can see well in the dark and can demoralize others for short periods; otherwise he knows no spells. Asking him about Dro'Sakhar will have him confirm his identity by saying: "Yes? What is it?" This page was last modified on 23 April 2014, at 17:20.